Nothing Like a Saltwater Fish Fight! March 19, 2015 by Luis Umpierre Jr. and Luis Umpierre Sr. It started in the second drift with a TRIPLE HEADER on the bottom half of the low tide. We got to our honey whole at the right time… At first drift: ” don’t worry, it will light up like a light switch, the tide just started moving” and at the second drift (((BOOOM!))). Just imagine the energy explotion on our confortable and spacious boat, in face of not one but three over 90 degrees rod bending action with three Saltwater fish on!!! Awesome feeling! This time, we ended landing one and unfortunately a pilot boat captain approach us just as we finished that unforgettable moment, to tell us, in a very polite way, to move from the SPOT cause a huge ship was going to anchor in the area. 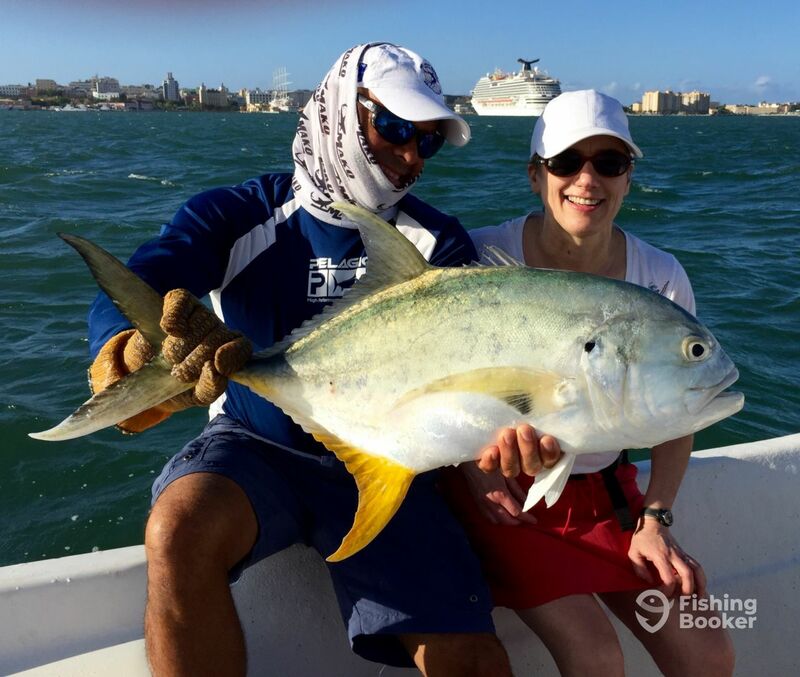 We did and the bite died out, the magic hour’s switch was off and not present at plan B… Nevertheless, we had other strikes and ended landing two more fish, one of them a great size Jack Crevalle (shown on photo) and a almost 30 inch Snook; Steve’s first ever! Congratulations to both Leslie and Steve for your biggest catches and saltwater fish fights yet and thank you for allowing us to serve you and to collaborate on your new fishing stories that will last a lifetime and will be shared with friends and family.